Lock up your children and your souls! The infernal hordes are here, razor-edged and ready to rampage. 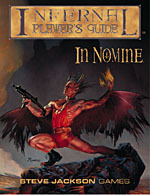 The Infernal Player's Guide contains everything you ever wanted to know about demons – their history, their laws, the Bands they belong to and the Princes they serve . . . even the paths that can lead them to Redemption. In addition to expanded demon descriptions, it provides mixed-campaign concepts, rules for playing Renegades on the run from Heaven and Hell, the grim realities of life and the grimmer facts of demonic reproduction. There's also a step-by-step "Demonic Creation Guide" for quickly and easily generating unique demon characters.